My first brush with the life-threatening nature of western wildfires came on a sizzling-hot day in October 1973. My Pitzer classmate John Warfel ’74, then living in a dilapidated cabin in Palmer Canyon, had been asked by his landlord to clear space around the structure in case fire swept through the Claremont foothills. Channeling Tom Sawyer, he regaled a group of Eastern transplants, not least this fresh-faced sophomore, with the joys of cutting back yucca, trimming scrub oaks and hacking through sharp-bladed grasses. He forgot to mention poison oak. By the end of the day, we were dehydrated, sunburned and red-rashed, but had succeeded in opening up about a 100-foot swath. The poison-oak scars remain, as does the chilling realization that that ramshackle abode, if still standing 30 years later, would have burned in October 2003 when the Padua Fire tore through Palmer Canyon. Since then, Claremont’s hillsides have been relatively wildfirefree. But that could change quickly, as the December 2017 quartet of fires—the Thomas, Creek, Rye and Skirball—demonstrated. 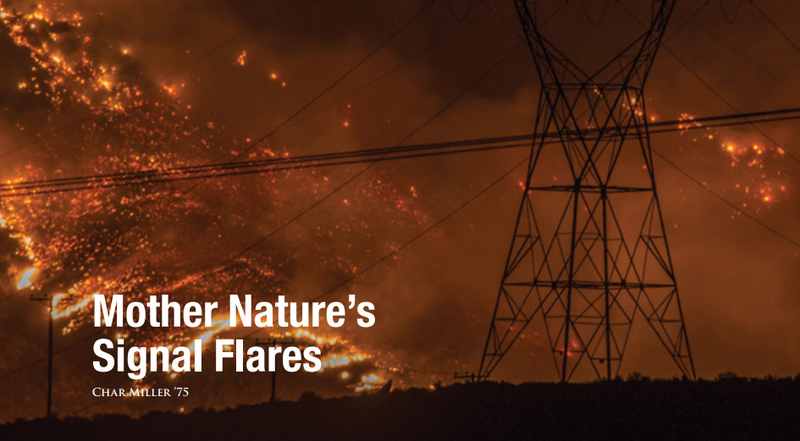 What fueled them (the climate-charged lengthening of Southern California’s fire season and the drought-desiccated landscape) at some point will turn our skies black. Now would be a good time to decrease, where possible, the odds of the next devastating inferno. First, some caveats. We will never excise fire from the land and should not. The chaparral ecosystem, which dominates the region’s high ground, is fire-adapted for a reason. This region burns. The vast majority of our fires across time have been anthropogenic— human caused. The ignition sources are many, but the results can be beneficial. Fire regenerates landscapes, as the Claremont Hills Wilderness Park, which the Padua Fire torched, attests. The problem comes when wildfire collides with the built environment. The Thomas Fire, which burned more than 280,000 acres in Ventura and Santa Barbara counties, incinerated suburban subdivisions and urban streetscapes. Nature, in a flash, can destroy our best-laid plans. That does not relieve us of the responsibility of planning. For foothill communities nestled into the San Gabriels, from Claremont to La Cañada Flintridge, that means controlling development within what CalFire calls Fire Hazard Severity Zones. Planning boards and zoning commissions must alter their practice of green lighting every housing development in every canyon, foothill and ridgetop. These subdivisions are among those that burned this past year. Another strategy that Monrovia, Glendora and Claremont have pursued has been to purchase uphill land and developmental rights from willing sellers, extending the buffer zone available for housing developments downhill. We must scale up this proactive approach. One possibility is for communities and county governments to devise a “fire-and-flood-zone bond.” Its revenues would buy currently open land and purchase from willing sellers those homes incinerated in wildland fire or destroyed by subsequent mudslides, such as ravaged Montecito. Regardless of funding format, this region-wide initiative must be done and soon. The climate drivers that have been drying out the US southwest since the ’80s will continue in force across the twenty-first century and beyond. This is accelerating the incidents of dangerous fires and floods, making the need for more defensible and open space even more crucial in the coming months and years. It is past time for local politicians, policymakers and citizens to pay attention to the climate-change signal flares if we are to have a chance to build smarter and more resilient communities in the nation’s everwidening disaster zones. Char Miller ’75 teaches in the Environmental Analysis Program at Pomona College. His recent books include Not So Golden State: Sustainability vs the California Dream; America’s Great National Forests, Wildernesses & Grasslands; and Where There’s Smoke: The Environmental Science, Public Policy, and Politics of Marijuana.